What are the differences between the three pitching machines? 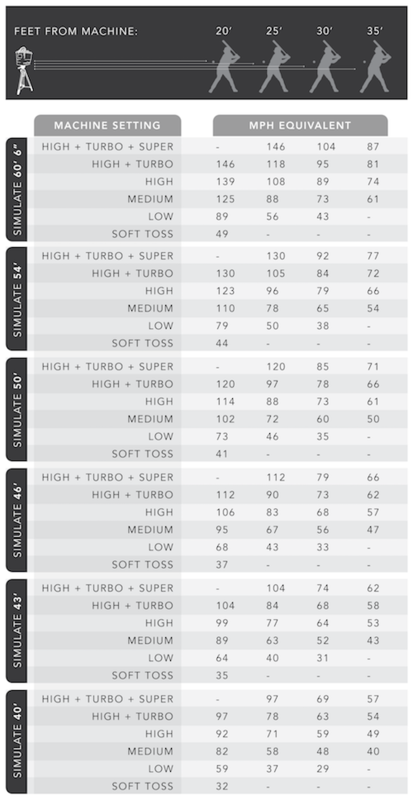 Wondering how the MaxBP pitching machine models are different? We've worked up this handy chart to illustrate the differences in features and functionalities. Our MaxBP Pro pitching machine is best suited for advanced hitters and teams looking for a full-featured hitting tool. 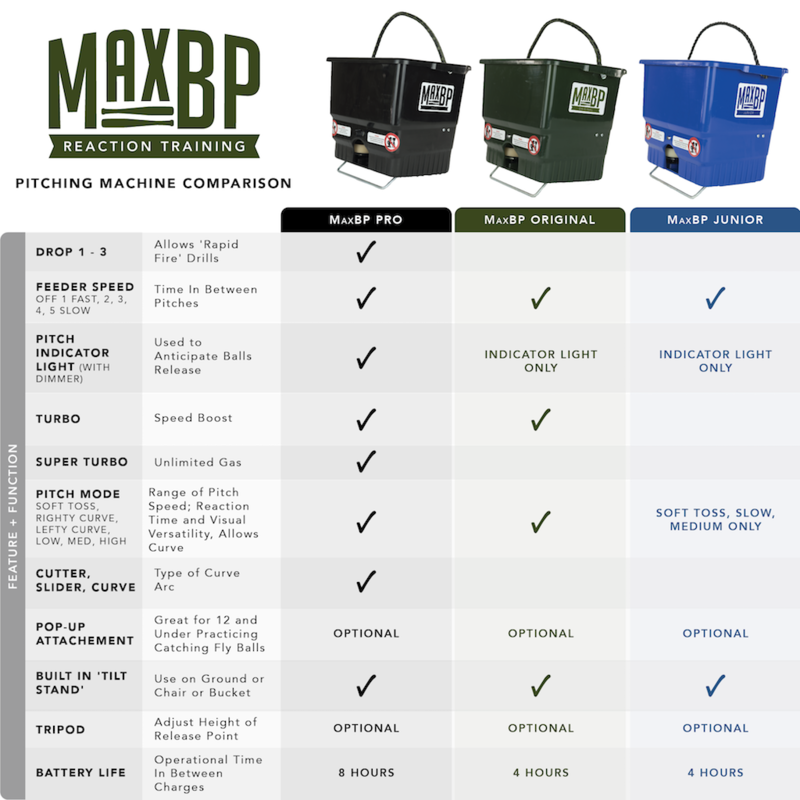 The MaxBP Original pitching machine is great for mid-level teams and hitters looking to grow their contact consistency. The MaxBP Junior pitching machine is perfect for younger hitters and teams looking for basic features to build a foundation. How do I unsubscribe from the MaxBP mailing list? We are sorry to see you go, but if you would like to stop recieve email updates from MaxBP, please visit our Email Unsubscribe link. What happened to the Sandlot Slugger pitching machine? It hasn't gone anywhere! We recently changed the name of our Sandlot Slugger pitching machine to the MaxBP Junior as a part of our new brand. Don't worry though, the MaxBP Junior has all the same features and durability as the Sandlot Slugger. Any chargers or accessories you have for the Sandlot Slugger will work on MaxBP Junior. How do I connect the tripod to the pitching machine? Check out this helpful video we put together to show you how to connect, use and remove the Tripod II from the pitching machine housing. I have a question not covered on this page. How do I contact the Support Team? If you have a question we haven't covered, you can contact our Support Team by one of three methods. We're here to help and make your experience the best one possible. Don't hesitate to let us know how we can help. MaxBP accepts credit card payments and payment via purchase order. When paying with a purchase order, or need a quote to generate a purchase order, please follow the following steps. 2. If you are purchasing using a purchase order, please select shipping method. If you are generating a quote, please select the free 4-6 day ground shipping. 3. On the "Checkout Page", please select "Purchase Order" as payment option. What credit cards does MaxBP accept? We accept all major credit cards including Visa, Mastercard, American Express, Discover, and JCB in addition to Apple Pay and PayPal. Having trouble with your credit card or need to pay with a Purchase Order? Contact support@maxbp.com for help. We strive to fulfill your order and ship it to you as fast as humanly possible. However, a general rule of thumb for your order is that it will be shipped and on it's way to you within 24-48 hours of your purchase. Why isn't my tracking number reporting anything? Our system generates a tracking number when the label is printed. FedEx enters the shipment into their tracking system upon pickup and sometimes, if they are busy, not until the driver drops packages at FedEx distribution center. The majority of shipments are FedEx Ground, though USPS is used in some scenarios. Typical ship time is 2-3 business days to the West Coast, 3-4 business days to the central US and 4-5 business days to the East Coast. The majority of our shipments originate in Portland, OR. My battery stopped working, now what? Like all batteries, you have to take proper care to get the most out of the battery. If your battery does begin to lose power or stop all together, we have the following options. Nothing is more disappointing than pulling out your pitching machine for the first time for the season to find that its battery is no longer taking a charge. Because it is like a car battery, if it is put away on a low charge and not “topped off” periodically during the off season it may not take a full charge again. What are your options now? If you consider yourself handy, your order of one or two new batteries and a handy tutorial video we have, replacing the batteries on your own takes a few tools and a half an hour or so of your time. You can purchase the batteries here https://www.maxbp.com/collections/accessories/products/maxbp-sandlot-slugger-battery-replacement-self-service and along with the video we are more than happy to support you through the process over the phone. We've been doing this for years so our opinion about the ease of replacement may be a little biased. If you don't feel like doing it yourself is an endeavor you would like to attempt we will be happy to replace them for you! You can purchase the factory replacement option here https://www.maxbp.com/collections/accessories/products/maxbp-sandlot-slugger-battery-replacement-ship-to-factory and ship it to us for the work. Most batteries are replaced and machines shipped back to you within two days of our receipt of your machine. Your pitching machine has a rechargeable battery that can be charged up to 700 times depending on the nature of the care given to the battery. similar to a car battery, We have many machines that are 8 years old with their original batteries. If the battery is left in a low charge condition for a period of time the battery will no longer take a charge and your pitching machine will slow down or stop all together. To achieve maximum battery life it is recommended that the battery never be left in a low charge condition. It not harmful to the battery to run the pitching machine until you are out of power, but it is extremely important to overall battery life to give it a good over night charge within two days after a full battery discharge. If you store your machine for an extended period of time (2 months or more) your must fully charge the battery (minimum of 8 hours) before storage. Also, to maximize battery life, you should give the machine a full charge about every 2 months, again, similar to a car battery. How do I best take care of the battery? If the battery is left in a low charge condition for a period of time the battery will no longer take a charge and your pitching machine will slow down or stop all together. To achieve maximum battery life it is recommended that the battery never be left in a low charge condition. It not harmful to the battery to run the pitching machine until you are out of power, but it is extemely important to overall battery life to give it a good over night charge within two days after a full battery discharge. If you store your machine for an extended period of time (2 months or more) you must fully charge the battery (minimum of 8 hours) before storage. Also, to maximize battery life, you should give the machine a full charge about every 2 months, again, similar to a car battery. How can I tell if the charger and batteries are working properly? Test 1: Plug the charger into the wall socket and plug the connector into the machine. Is the charger light on? Test 2: Plug the charger into the wall socket but do not plug the connector into the machine. Is the charger light on? Test 3: Remove the charger from the wall socket and plug the connector into the machine only. Is the charger light on? If the light is on in test 1 there is a solid connection from the charger to the battery. There still is a possibility that the battery is weak. If the lit is not on there is a problem with either the charger or battery or both. If the light is on in test 2 that usually indicates the charger is working properly. If the light is off the charger is no longer working correctly. There is still a possibility that the batteries are also not taking a full charge. If the light is on in test 3 the internal wiring and connection to the charger are sound and the battery has some charge. If the light is dimly lit compared to the previous tests, the battery is in a low charge condition. After charging for 8 hours and the light is still dim, the battery probably is not taking a full charge. If the light is off, the battery probably needs to be replaced. Can I plug the MaxBP into a wall as opposed to letting it run off battery? Yes. Actually the charger charges the batteries and the batteries run the machine. If you use the charger at the same time it should keep the battery close to fully charged. The charger along does not produce enough current to run the motors at full speed, that is why the machine runs off the battery at all times. If you run the machine at turbo or super turbo speed the charger may still not be able to keep up with the power used, but it would definitely significantly increase the battery run time. What are the specs for a replacement charger? We use a charger that produces 7 volts DC at 700 ma, Output connector is 2.5mm x 5.5mm female center positive.. These chargers are custom made to our specs. It will be difficult to find this charger exactly to these specs. You can use a 6 volt DC charger in a pinch (any ma current but must be center pin positive). It will not fully charge the battery so you may experience a machine that does not pitch up to full speed. How do I use the external battery pack if my machine already has a battery in it? In some cases, such as your internal battery being dead or defective, you may want to use the external battery pack even though your pitching machine has a battery already in it. If this is you, there are a few important steps you need to follow to make sure your machine will operate properly. Find the leads (black and red wires) connecting the machine to the battery terminals. Using proper safety precautions, disconnect both leads from the machine. Connect the plug from the external battery pack to the machine. This will allow for full use of the external battery's power. Step 3: Power on the machine to ensure normal operation. Attempting to connect the external battery pack while the existing internal battery is still connected will cause the battery power to average out and not properly supply enough power for the machine to run appropriately. Questions? Shoot us an email at support@maxbp.com. Can the MaxBP work in the rain? Probably not a good idea, like most pitching machines if the balls get wet they will slip as they go through the pitching wheels and be extremely erratic. Water can also damage the machine. Wind is causing a problem with pitch accuracy, any suggestions? The faster the pitch, the better your chances are of minimizing the effects of wind. Because it is a light weight plastic ball, wind over 15 MPH is bound to effect the accuracy. Additionally, pitching with (same direction) the wind as opposed to across will improve accuracy. How far away should I set up the machine from the batter? The initial set up should be about 30 feet. Once you use the machine you may find that you may want change this distance, depending on your needs. If the machine is pitch too fast for you, move a little further away from the machine. If you want to have a faster reaction time, move closer to the machine. 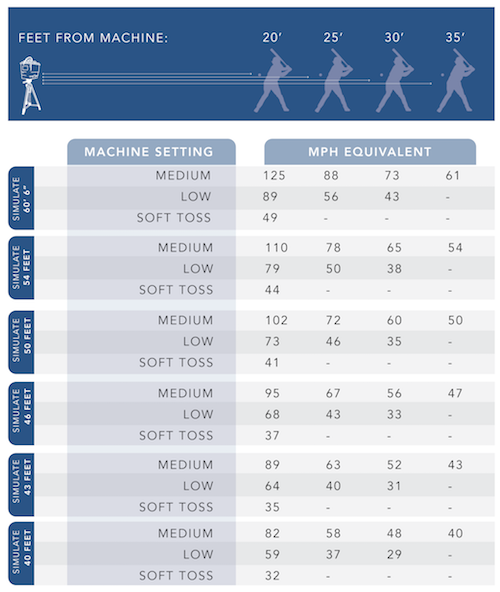 What MPH pitch equivalent does the pitching machine throw at different distances? 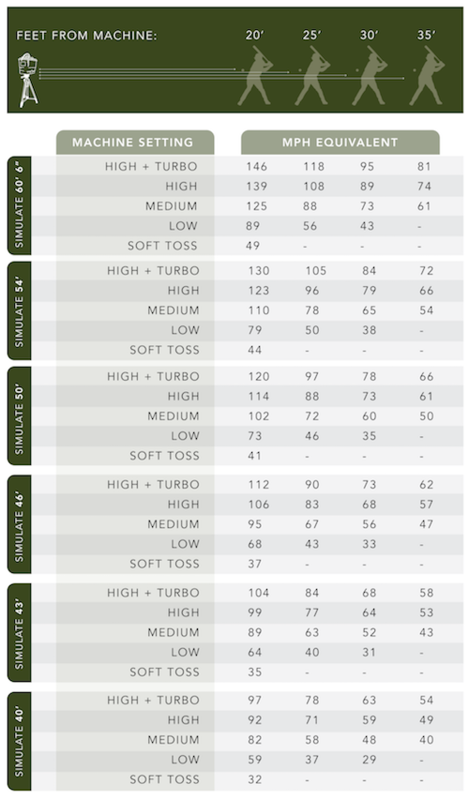 The pitch speed setting on your machine and the distance your batter is from the MaxBP pitching machine determines what reaction time you are simulating and what MPH pitch equivalent you're seeing during your training. Looking to train for typical reaction times at a certain pitch speed? 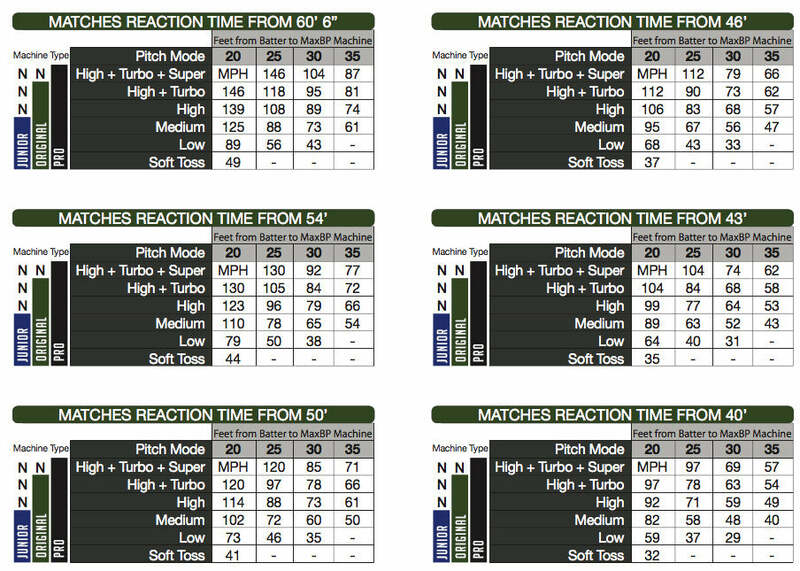 Check out the charts below to find the optimal machine speed setting and distance from the machine you should be at to train for the same reaction time you're seeing in the game. What other types of balls can I use in the MaxBP? The Wiffle brand works best in the MaxBP Machines. We do not recommend using other types of balls with the MaxBP pitching machine. Any ball with the same weight and diameter (golf ball size) will pass through the machine with no issues. Some of the other types of balls may not achieve full speed and may not be as accurate. What are some good drills or stations to work on with the MaxBP? See our blog for hitting and reaction training drills. Can I use the MaxBP to practice catching flyballs or ground balls? Definitely. Fly balls require the use of our optional pop-up attachment because the machine can’t be tilted to far back or the balls will not feed through the machine. This is highly recommend for those 12 and under, a sure thing to save a few knots on the melon and build player confidence before transitioning to practicing the real thing. Pop-up can be added on to any machine at purchase or it can be bought separately here if you already own a machine. My son or daughter is hitting too many home runs now and they are no longer throwing him good pitches, what should we do? Teach him or her to wait for his or her pitch. Or, you could try holding off on training with the MaxBP pitching machine to reduce his or her home runs. But really, why would you want to do that?